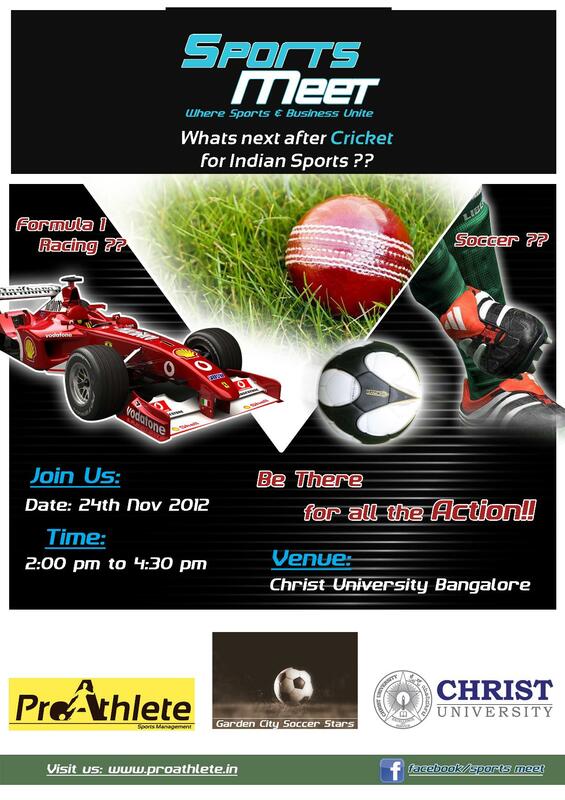 November edition of SportsMeet had few exceptional speakers which held the audience in Christ University enthralled. Former India International, Raman Vijayan walked thru his formative years. The highest scorer of I-League (erstwhile NFL) for the 1997-98 season came from the fringes of Tamil Nadu. 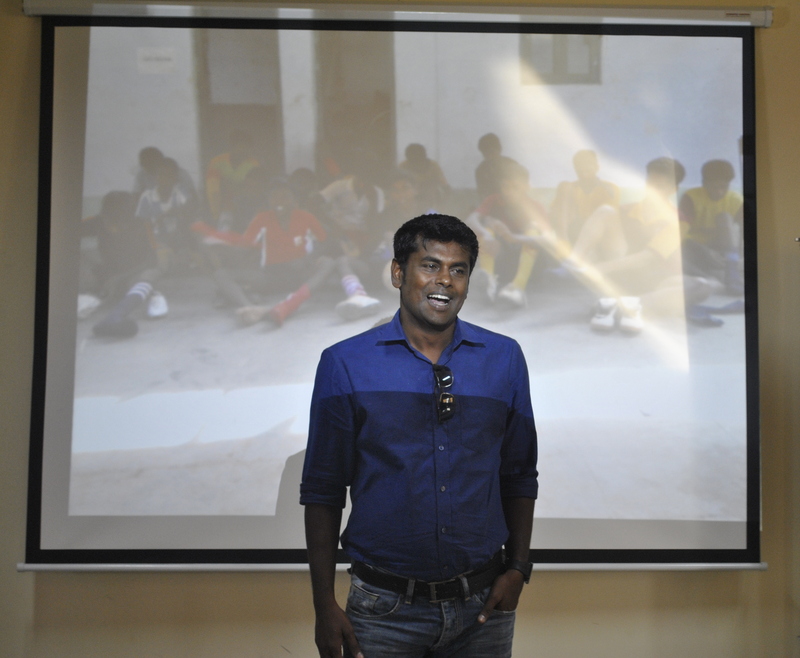 His village had no football field, yet he had a dream, and finally made it big! After playing for many years, Raman always had the urge to give back to the game. He noticed that the not many schools were employing physical education teachers in the middle-school yet there are state- and national level tournaments for the juniors. Noble Football Academy was formed in 2009. Raman held an open camp with support from few sports enthusiasts. 4000 students turned out for trial and 40 got selected for a month-long residential camp. Most of the students came from poor background, with several daily wage workers. The camp consisted of school providing free education. He urged to enthusiasts to sponsor in kind not just cash – in came various sponsors in the form of football kits, foods, and so on. Till date 25 boys from different age groups from his academy has participated in the state-level tournaments. Two of his academy boys are now playing for South United FC, a private owned professional football club, where he is serving as a head coach. Earlier, the session was kick started with a demo session from Bangalore Youth Football League, a football academy imparting football training to the youngsters. Premdeep Gangadharan, co-founder of Fans on Stands, a sports tourism firm shared his Formula 1 experience and how this sport has a great potential in India. Witness of Formula 1 races for several seasons across the globe, Premdeep highlighted this sport to be a new client entertainment destination for the corporate world. 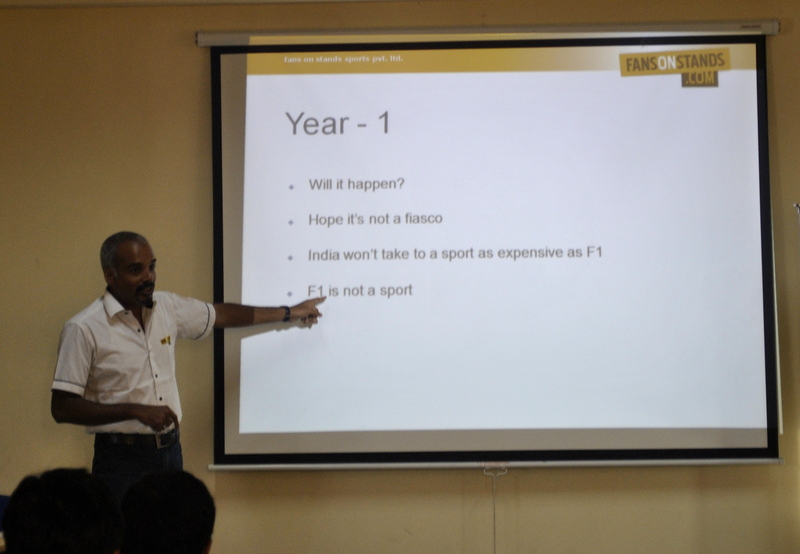 Premdeep presented a detailed comparison between the two Indian Grand Prix – 2012 and 2011 which was one of the best parts in his session. Just when you thought that there’s no news about the SportsMeet event for November, here we are – we may bring forward or postpone a week, but definitely try to bring SportsMeet every month to you! So here’s SportMeet ready with the November event – a monthly meet up for the sports professionals, sports business, and enthusiasts of Indian sports. What do we have for this month? We’ve some experts coming to share and deliver on what’s next for Indian Sports by looking beyond cricket. We also have a demo session from Bangalore Youth Football League (BYFL), a football academy imparting football training to the youngsters and Naveen Ningaiah sharing his experience of recently held International Sports Summit – Turf2012. SportsMeet is a platform where the sports professionals – athletes, coaches, physios, managers, and so on), sports business, sport enthusiastic, and sports management aspirant network, discuss, and collaborate. An amazing meeting place for the sports lovers, those who loves to talk about sports, interested to promote and grow Indian sports, and keen take it to the next level.